India has a tremendous biomass potential which could easily be relied upon to fulfil most of our energy needs. An estimated 50 MMT (million metric tonnes) of liquid fuels are consumed annually in India, but with the actual biomass potential and its full utilization, India is capable of generating almost double that amount per annum. These biomass estimates only constitute the crop residues available in the country and essentially the second-generation fuels since the use of first-generation crop bases fuels in such food-starved nations is a criminal thought. Currently, there are various technologies available to process such crop residues and generate value products from them. However, essentially, they all revolve around two main kinds of processes, either biochemical or thermal. The biochemical process involves application of aerobic/anaerobic digestion for the production of biogas; or fermentation, which results in the generation of ethanol. Both these products could be subsequently treated chemically and through trans-esterification process, leading to production of biodiesel. Alternatively, the thermochemical processes involve either the combustion, gasification or pyrolysis techniques, which produces heat, energy-rich gas and liquid fuels respectively. These products can be used as such, or could be further processed to generate high quality biofuels or chemicals. The estimated organized energy breakup for India is 40 percent each for domestic and transport sectors and 20 percent for the industrial sectors. The current share of crude oil and gases is nearly 90 percent for the primary and transport sectors and the remaining 10 percent for the generation of industrial chemicals. The escalating prices of crude oil in the international market and the resulting concern over energy security, has lead developing nations to explore alternative and cheap sources of energy to meet the growing energy demand. One of the promising solution for agrarian economies is Biorefinery. Biorefinery is analogous to the traditional petroleum refineries employing fractional distillation process for obtaining different fractions or components from the same raw material, i.e. the crude oil. Biorefinery involve the integration of different biomass treatment and processing methods into one system, which results in the production of different components from the same biomass. This makes the entire chain more viable economically and also reduces the waste generated. The outcome ranges from high-volume, low-energy content liquid fuels, which could serve the transportation industry needs, to the low-volume but high-value chemicals, which could add to the feasibility of such a project. Steam and heat generated in the process could be utilized for meeting process heat requirements. By-products like chemicals, fertilizers, pharmaceuticals, polymers etc are also obtained which provide additional revenue streams. 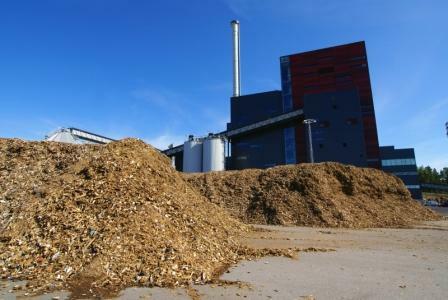 Biorefineries can help in utilizing the optimum energy potential of organic wastes and may also resolve the problems of waste management and GHGs emissions. Wastes can be converted, through appropriate enzymatic/chemical treatment, into either gaseous or liquid fuels. The pre-treatment processes involved in biorefining generate products like paper-pulp, HFCS, solvents, acetate, resins, laminates, adhesives, flavour chemicals, activated carbon, fuel enhancers, undigested sugars etc. which generally remain untapped in the traditional processes. The suitability of this process is further enhanced from the fact that it can utilize a variety of biomass resources, whether plant-derived or animal-derived. The concept of biorefinery is still in early stages at most places in the world. Problems like raw material availability, feasibility in product supply chain, scalability of the model are hampering its development at commercial-scales. The National Renewable Energy Laboratory (NREL) of USA is leading the front in biorefinery research with path-breaking discoveries and inventions. Although the technology is still in nascent stages, but it holds the key to the optimum utilization of wastes and natural resources that humans have always tried to achieve. The onus now lies on governments and corporate to incentivize or finance the research and development in this field. Tagged Benefits of Biorefinery, biochemical, Bioenergy, biofuels, Biomass, biorefinery, Chemicals, Concept of Biorefinery, Crop Residues, Energy, India, Lignocellulose, Model of Biorefinery, thermochemical, Wastes. Bookmark the permalink. I am interested in this project please send me full detail. Below is my true email I’d. pl send medeatils of biorefinary and project economics. Plz send bio pyrolysis project details on my mail id.